Republican candidate Bruce Lisman launched the first television advertisement of the 2016 Vermont gubernatorial race Tuesday. The 60-second ad is both a personal introduction and a blistering condemnation of Vermont’s situation. “Vermont is in a very bad place, and it’s entirely self-inflicted,” Lisman says, as he appears in the ad, which is slated to appear on WCAX, WPTZ, WFFF and WVNY. A WCAX filing with the Federal Communications Commission reveals Lisman has contracts for $28,000 to air the ads on the four stations. The WCAX contract, handled on Lisman's behalf by the national Republican strategy firm McLaughlin & Associates, runs through February 11 for 26 spots. 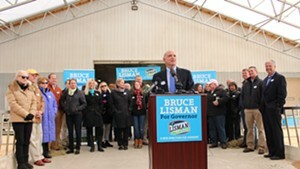 “It’s a modest buy, part of our overall communications strategy to introduce Bruce to Vermonters,” said Lisman's campaign manager Shawn Shouldice. Lisman himself returns to the screen. “Here’s my plan,” he says. “We’re going to hold the line on taxes, make our state more affordable and keep our young people right here. We’re going to cap budget growth, fix our broken health care system, so consumers have more choices.” He doesn’t offer specifics of how he will do that in the ad. “I’m going to lead Vermont in a new direction,” Lisman concludes. With New Hampshire's presidential primary scheduled for next week, Lisman’s ads will be competing for attention with a slew of presidential ads aimed at Vermont stations' New Hampshire viewers. 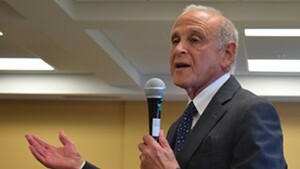 Lisman, a retired Wall Street executive who lives in Shelburne, is contending for the Republican nomination with Lt. Gov. Phil Scott. Democratic incumbent Gov. Peter Shumlin is not seeking reelection.